It’s (almost) true, and why not? Sometimes it seems like the colors of the year were chosen by a psychic channeling the 1960s, or a cabal meeting secretly in a fashion designer’s studio. The truth about how the colors of the seasons and year are selected is more complex although it does have an element of the psychic and the cabal. Two industry organizations - the Color Marketing Group and the Pantone Color Institute - forecast color trends. Both groups predict color palettes that will be used throughout the design industry, in fashion, interior design, industrial design, even the colors of plastic iPhone covers. Remember the year of the purple car? That color had to have been based on one of CMG’s or Pantone’s forecasts for automotive design. The purple car is a good example of the virtues of selecting a classic color for large purchases. 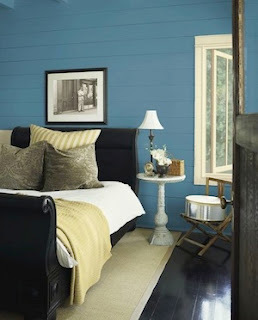 On the other hand, using a trendy color for less expensive items like paint and accent pillows is a great way to spruce up a space. CMG and Pantone base their forecasts on everything from the colors being used now by couture designers to pop culture to social, economic and cultural forces in America and abroad. 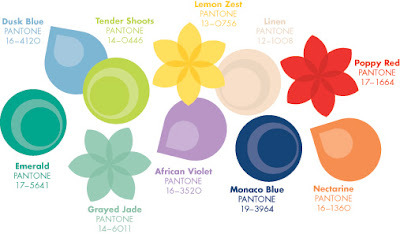 As for Pantone's forecasting, according to its executive director Leatrice Eiseman, "Colors for 2013 will need to coax and cajole, soothe or astonish, renew and replenish." Pantone has nine palettes of colors for interiors in 2013. Their “Midnight Mystery” palette reflects the human attraction to the dark side. As the company’s forecast material says: “The colors are moody, the vibe is masculine and the aesthetic is both Victorian and futuristic.” The sources for these colors include the return of “Dark Shadows,” Sherlockian hound’s-tooth tweeds and the sci-fi, fantasy and horror combo of Steampunk. The saturated colors are seductive. The interplay of time and nature inspires the “Honed Vitality” palette with its chalky and earthy colors. While environmentalism has inspired many color trends in the last five years, these colors reflect the lifestyle linked to environmentalism with its embrace of artisanship, home baked goods and natural products. “Vintage Moxie” is a palette of pastels pushed to deeper, bolder tones. “Mad Men,” the return of Twiggy and vintage Vespas are sources cited for the colors. The “High-Voltage” colors are virtually neon. They obviously draw on electronics and digital technology, but part of the fascination of color forecasting is that it’s not that straight forward. It references sources as disparate as Lady Gaga and India’s Festival of Colors, which have little in common - except color. Finally, here's some eye candy for you fashionistas: Pantone's forecasts of the fashion colors for the spring of 2013.